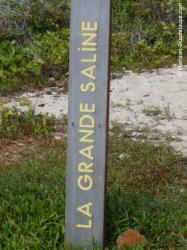 In the town of Saint Franços, just before arriving at the "Pointe des Châteaux", on the left, behind the vegetation, beach of "Grande Saline". A wild beach, very long. Located at the eastern tip of Grande-Terre, it is very ventilated and pleasant result in strong heat. The view is beautiful. Opposite the island of Desirade, on the right, the "Pointe des Châteaux". The beach is protected by a coral reef, but the waves pass easily above and can be powerful when arriving on shore. There is always a strong side current. A few meters from the shore, the rocks form "pools" natural where you can observe fish using snorkel.